About three years ago I wrote about Halloween being one of those things you're forced to care about when you have kids. If I hadn't procreated, I wouldn't think twice about this silly holiday. The kids, however, love everything Halloween, and the next thing you know you're hanging up little ghosts outside, putting cobwebs in the tree, sticking a skeleton on the door and, every year, you're carving a pumpkin. Last year I confessed that I'm not the world's best pumpkin carver. All my Jack O'Lanterns follow a similar pattern, and this year is no different. 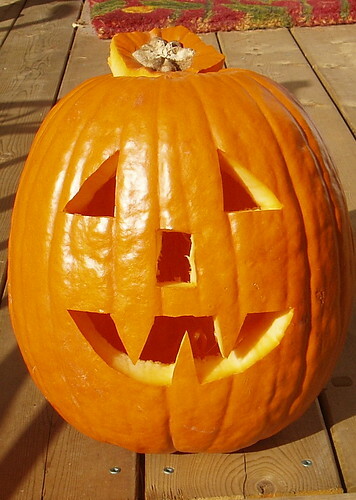 We just finished carving up this year's pumpkin only this year I gave the kids more say in the finished product. They insisted Jack have a rectangle nose, even though I always go with a triangle nose. Looking at the finished product, I should have trusted my instincts, but the kids are happy and that's all that matters. Here's our pumpkin carving photoset and below is the finished Jack O'Lantern, rectangle nose and all. It's not a silly holiday... it's fun & proving to be 50/50 for kids & adults alike now. I think I've seen pumpkins w/ rectangular noses... but I agree, triangular looks better.